A full suit is not only a big purchase (and often a big investment) it’s also the ultimate fashion challenge: How do you make sure your personal style shines through when you’re wearing the most traditional incarnation of workwear in existence? The good news is that suits are incredibly versatile. The better news is that you can break your suit up into pieces for exponentially more outfitting options. That means that not only are you getting your wardrobe to work hard for you, but you’re also getting that cost-per-wear price to drop precipitously each time you wear your slacks out on their own, or pair that blazer with a mini skirt. Below, we show you five ways you can wear a single suit. We hope these inspire you to put that investment piece to work in your wardrobe. We all know how to wear the suit in a classic way (you know, with a button-down blouse and pumps). But step one to utterly rocking the suit? Give the classic look a twist. Break out those clean white sneaks for ultimate cool girl vibes and wear a sleek white t-shirt underneath. The whole thing feels incredibly stylish and modern while still maintaining I’m-a-Boss undertones. There is literally nothing more street-stylin’ than a blazer with boyfriend-inspired jeans. 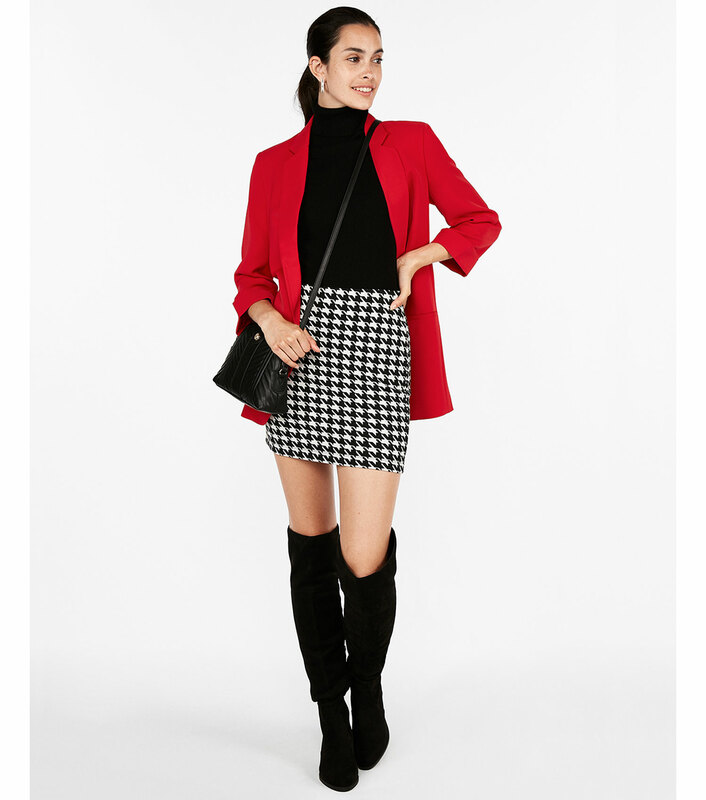 The fact that this blazer is super-hot red, only makes the whole affair even better. Jeans tone down a blazer and a blazer dresses up jeans which means the look meets somewhere in the middle. Animal print mules are just the wild cherry on top. This look is perfect for a creative meeting, perfect for drinks after work. Our Brand that Unites collection of streetwear inspired t-shirts will bring your workwear into the weekend in a snap. There’s no reason this suit has to lie dormant on Saturdays and Sundays, wake up your normal brunch routine by slipping into these fiery pants, a graphic tank, and a bum-bag. Your sleepy friends will be super impressed. Here again, an oversized blazer finishes an outfit so perfectly you’ll wonder why you hadn’t thought of it before. Balancing the proportions of a mini skirt with a boyfriend-inspired blazer is downright inspired. This is how you show up to work and knock it out of the park (it’s also a super cute date night look). Taking your outfit tonal is an advanced move we highly recommend. Red on red (in slightly different, or matching shades) is eye catching without looking over-the-top. 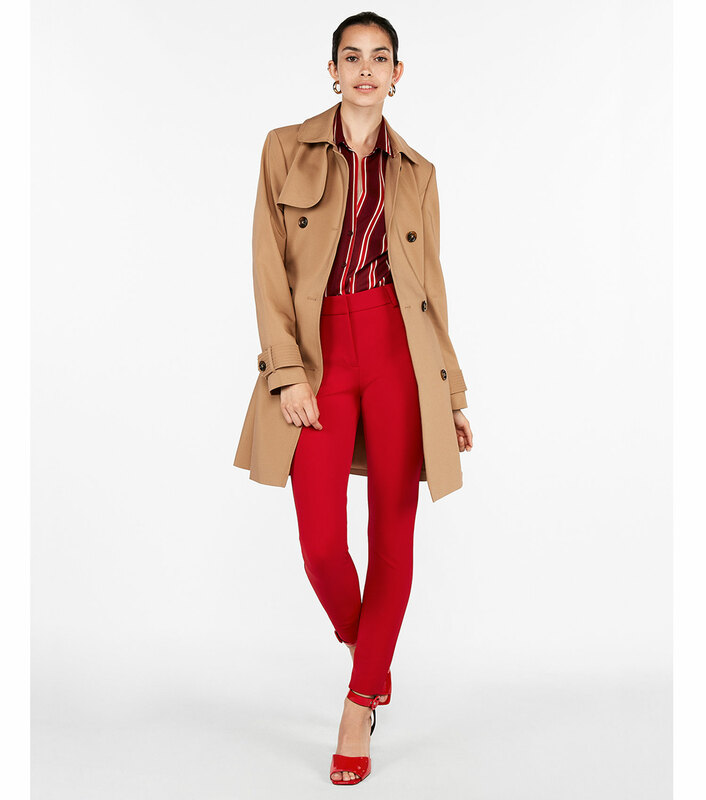 A classic trench just makes this look all the more classy. This is a look for making power moves, there’s no doubt about it.